Apple's aluminum Powermac G5 / Mac Pro case is definitely a thing of beauty. The case alone can be found on eBay for as much as $200, proving that people still find this case intriguing even with all the guts removed. Apple used this same basic case design from June 23, 2003 all the way until October 22, 2013 when they introduced the new trashcan shaped Mac Pro. That's over 10 years of the same basic case design. I've used a few of them in the past as stacking cabinets to store cables, extra hard drives and other assorted tech. But after seeing this creation by Klaus Geiger on a German website, I knew I had to have one of my own. So I mentioned this strange project to our amazing contractors Wayne and Jill who had just finished completely remodeling our kitchen. 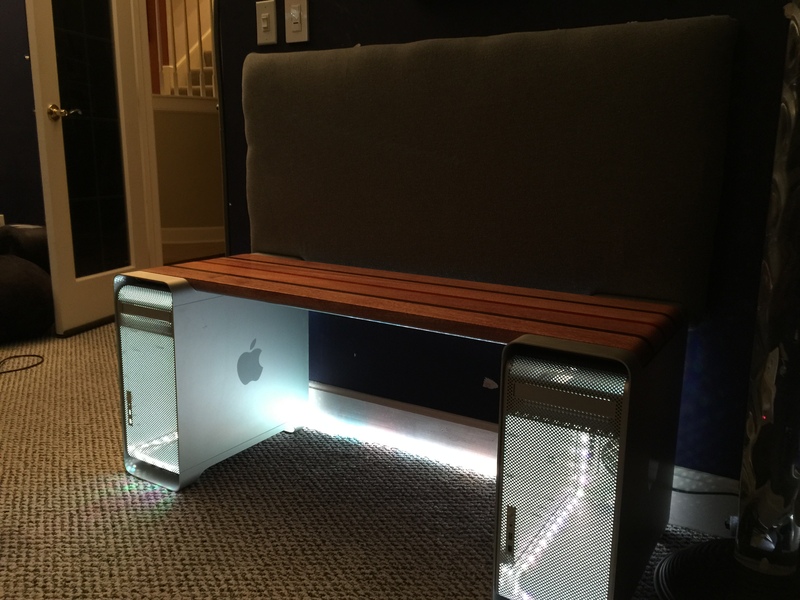 I provided the gutted Mac Pro cases and they took care of getting some seriously gorgeous wood pieces and expertly crafted and assembled the bench. 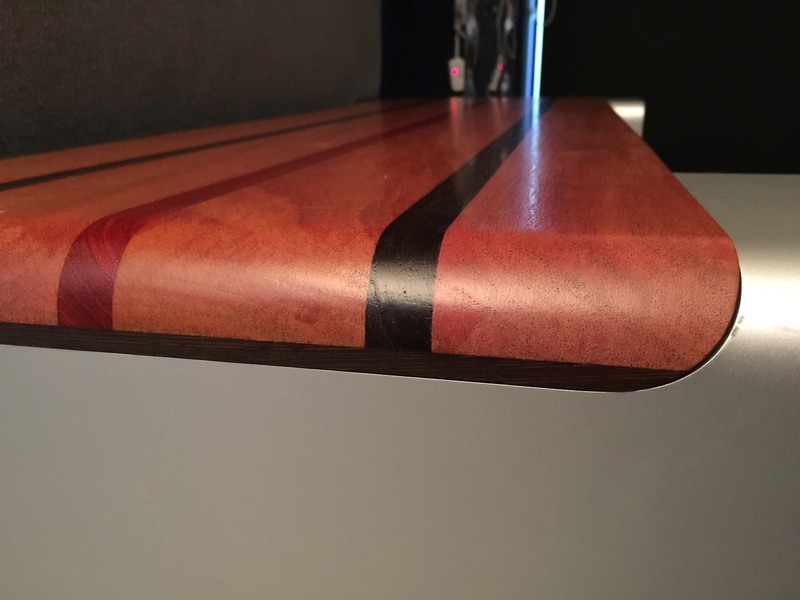 Wayne used 3 types of wood to create this masterpiece: African mahogany, Wenge and Padouk. He chose these specific wood types based on the natural color of the wood (absolutely no stain was used) and the cool grain detail of the pieces. 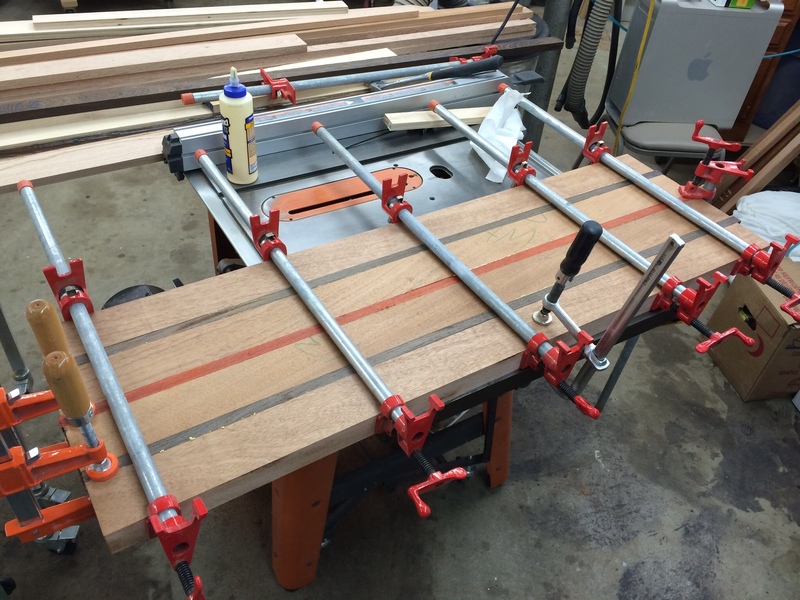 After picking out the wood, Wayne cut and glued the pieces together, sandwiching the reddish Wenge and purple Padouk between the lighter African Mahogany. After letting the glue set, he took the piece downtown to use a special wood planer to get the piece completely smooth and the right thickness. Then he used a very specific router bit to get the edges to exactly match the tops of the Mac Pros. Next Jill applied many clear coats of sealant to the piece to bring out the natural colors of the wood and protect it. They then screwed the piece to the cases from the inside so absolutely no hardware is visible from the outside. The amazing results can be seen in the pictures below. 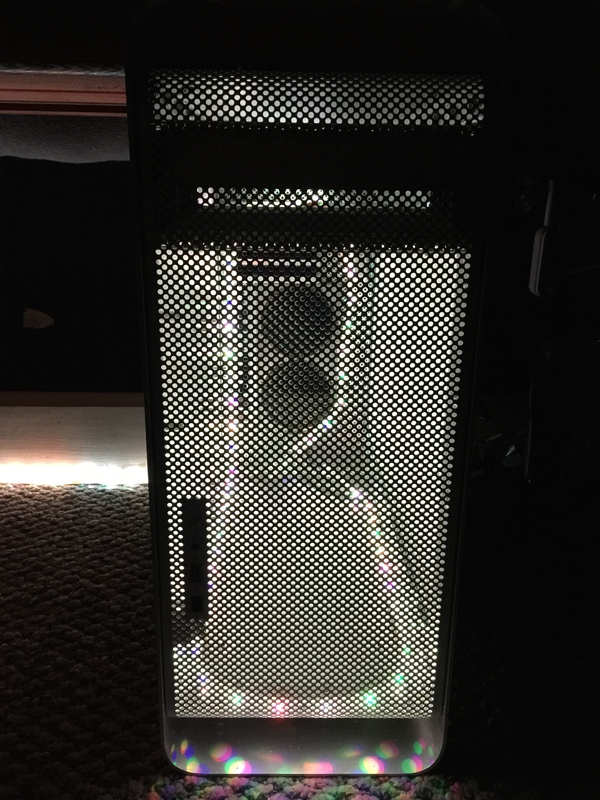 After delivery, I installed a long strip of LED lights inside the units to illuminate them from the inside. 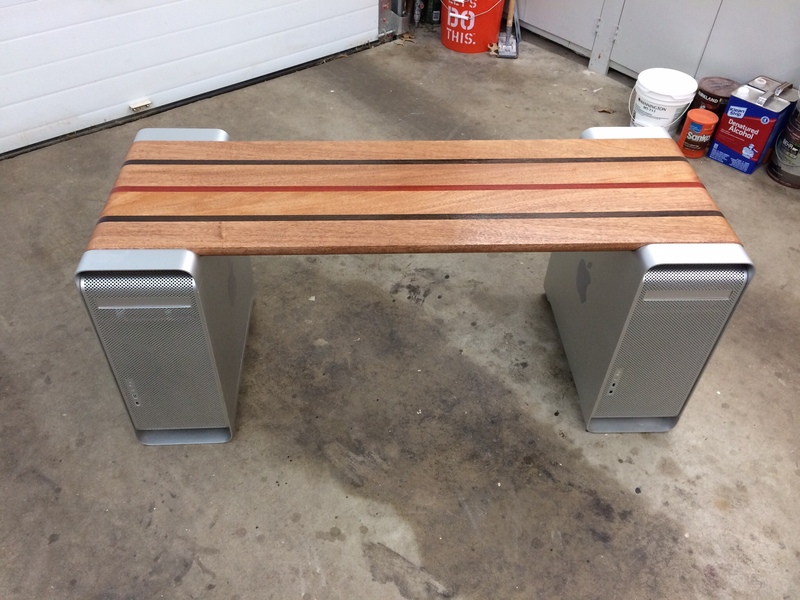 I also used some old memory foam, plywood and an old comforter to create a soft spongy backrest to lean against while sitting on the bench. 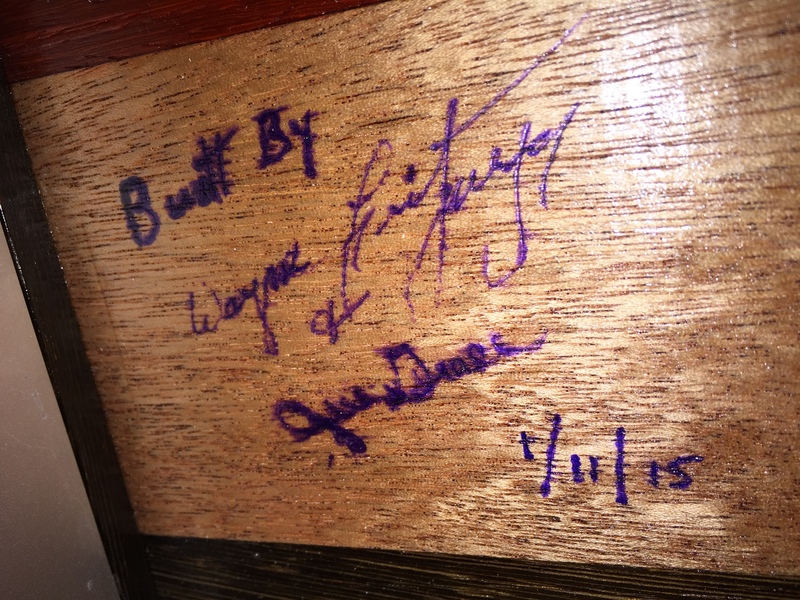 This unit is definitely one of a kind, so I had Wayne and Jill sign the underside of the piece for posterity. Do you have old Apple tech that is simply too gorgeous to throw away? Upcycle it into something new…take a look at some of the other projects on this blog (use the links on the right) to see how I created some interesting projects including iPad and MacBookPro cases, Halloween costumes, shelves and more. Thanks to Wayne and Jill for their hard work and expert woodworking skills!